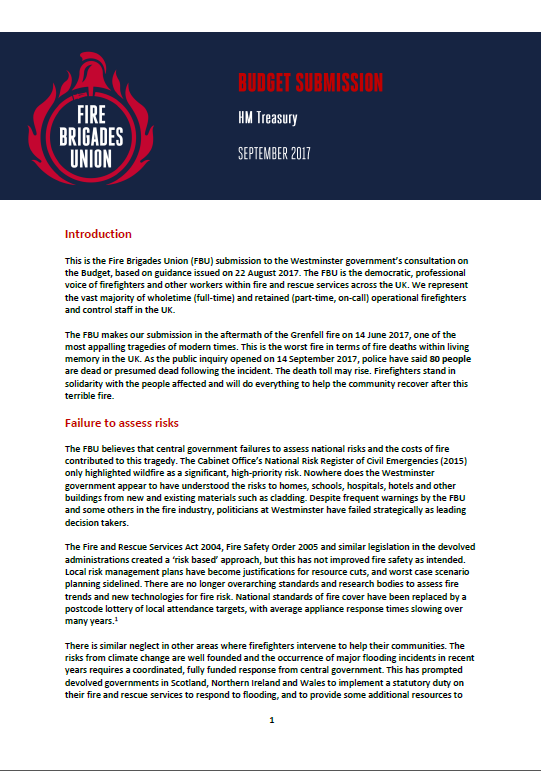 This is the Fire Brigades Union (FBU) submission to the Westminster government’s consultation ahead of the 2017 Autumn Budget, due to be delivered on 22 November. Following the Chancellor’s announcement in the Autumn Statement 2016, there will now only be one fiscal event in each year. From 2018 there will be a Spring Statement, but no major fiscal event. As a result, there will be no representation process ahead of the Spring Statement 2018. The Government has therefore asked interested parties to submit a representation. Whilst the union's expectation levels are fairly realistic as regards to the Westminster Government protecting the fire and rescue service, the FBU Executive Council felt it important that the union made a submission and also sent a message to the service about what we expect from our elected politicians. You can download the document via this page.